The Church of Latter Day Saints (LDS) recommends keeping 1 year of food storage on hand at all times. This recommendation stems from a time when the vast majority of people were subsistence farmers. A 1 year supply would ensure if there were a horrendous crop failure, you would still be able to eat. Today the likelihood of such a calamity is rare, and storing a 1 year supply of food for a single person takes up a large amount of space. I believe that a 6 month food storage supply provides the vast majority of benefits of a 1 year food storage program, at half the cost and half the storage space. The primary reason for bulk food storage in the US today is from a micro standpoint and not a macro one. It is far more likely that an individual will face financial hardship than a nationwide or worldwide collapse of the farmings industry. By purchasing shelf stable foods in bulk, I can save money on the total cost of groceries AND since grocery prices tend to increase over time, having a developed long term food storage supply protects me from inflation. When facing a job loss or reduction in hours, dipping into a built up food storage of inexpensive foods can easily save $500 a month in expenses. The secondary reason for long term food storage is localized shortages. Without fail, whenever a major storm hits in the US the grocery store shelves are cleared in a matter of hours. Look at the aftermath of Katrina and the power outages of the northeast back in 2011. In addition to the stores being emptied out by panicked shoppers, leaving the home in such situations can be dangerous between the weather conditions and the other panicked consumers who only have a few days of food supplies in their homes. Major world wide calamities are the least of the contributing factors towards deciding on keeping a long term supply of food storage, but it gets all of the attention. Try mentioning that you are storing food to a neighbor or friend and the FIRST thing they will think is that you are preparing for a nuclear holocaust. It is possible that major natural calamities can occur that will cause shortages of food, but overall massive world wide disruptions in the food supply are more likely to result in price increases and not necessarily widespread shortages of basic foods. Massive country-wide, and world wide food shortages are extremely rare, but have occurred due to droughts (think 1930s dust-bowl), war (Look at Germany and France in WWI and WWII), political malfeasance (Look at Russia in the 30s), and disease (Look at the Irish Potato famine and the current avain flu outbreak). In 2015 grocery shelves in Greece were empty due to the default of the country on its debt payments. The banks were closed, cash was restricted to $60 a day, and the grocery shelves were empty. Facing a time like this, I bet most Greeks wish that had the security of 6 months of food storage stocked away. Look at what has been happening in Venezuela. People are literally starving to death and digging through trash for scraps. Major country wide and worldwide collapses can cause food shortages, but by and large they are not the primary reason most people start a food storage plan. Regardless of the rationale you choose as to why to build a food storage supply, the time to get started on it is now. Long term food storage should be supplemental and not the primary food source: A 6 month supply will last 6 months if it is the only thing eaten, but realistically even in an extremely bad situation you should be able to buy some food, grow some food, forage for some food, and hunt/fish for some food. The food storage should supplement these efforts, and thus should be able to stretch over a year if needed. 6 months is a decent buffer: Most job losses and major financial hits are under 6 months. Having a 6 month food storage supply could carry the average family through a sudden job loss, keeping one of the largest expenses we have (groceries) in check during hard times. I normally spend $500 – $600 a month on groceries, IF we had a sudden job loss or other calamity, we could live mostly off of our 6 month food storage supply and save at least $400 per month in groceries. This would help emergency fund cash stretch longer. You can always add more later: Just like an emergency fund of cash, a food emergency fund can always be added to later. When saving for an emergency fund my primary goal was to hit 6 months of expenses. Once I achieved this I slowly added to it over time during months when cash flow exceeded expenses and investment goals. I see food storage the same way, 6 months is my initial goal, but once it is reached I may still add to it, but at a slower pace over time. I originally planned to go after a 1 year supply, but it seemed very intimidating. I am limited on available storage space and it was a huge stretch to come anywhere near a 1 year supply. When getting started with long term food storage the first “layer” of food is simply extras of the stuff you normally buy. Buy extras of the things you normally buy and stock up on sale items. Think along the lines of things like pasta, pasta sauce, peanut butters, crackers, cereal, canned goods, etc. It is important to keep expiration dates in mind and rotate your stock. My kids love peanut butter and when my local grocery store had the 40oz jars on a deep discount we stocked up to a several month supply. Once you have a decent amount of these items filled up, building bulk storage is the second layer. Bulk food storage is things like wheat, sugar, beans, and dry dairy products. Properly stored grains and dry beans can last indefinitely. Proper storage for most items means sealing them in mylar with an oxygen absorber and putting in an opaque, rodent proof container. Before we get ahead of ourselves the first step in building a long term food supply is deciding how much is needed. I am storing a wide selection of grains and beans to give a bit of variety. 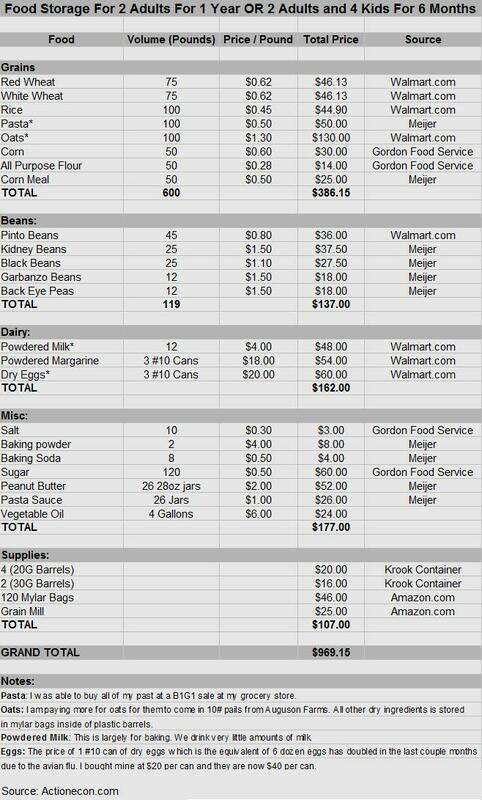 The chart below shows what I am storing and what the costs are. It is possible to get items cheaper than what I have on here, but it takes some work and some luck. If you happen to live near an LDS cannery you can save a lot of money on bulk staples. I have seen price lists where you can get 25 pounds of wheat for $6, this is about $10 less than what I am paying through Walmart.com (which is still a good deal). For people storing food for a large family or a longer term it may make sense to talk to a local grain mill to see if you can buy food in bulk. I have not had much luck finding places around here, including Sams club and Costco that have bulk grains and beans at decent prices. Overall this is a really inexpensive way to store 6 months worth of food. How much money do you spend on groceries each month? For a family of 6 I’m sure it is several times greater than $1,000. Alternatively if this is too time consuming of a process for you, you can elect to buy freeze dried meals that store for decades. These are much more expensive options and they generally run around $150 per month per person . For a family of 6 this would total $5,400. Note: All purpose flour and corn meal does not store nearly as long as whole grains. These should be rotated every 5 years to ensure freshness. All purpose flour is extremely cheap and is easy to use. Most people when baking whole wheat bread will use 25% to 50% all purpose flour with wheat to make the taste closer to “normal” american bread. Some food storage experts recommend against storing flour because of this, but I will continue to store flour because it is insanely cheap, cuts out a lot of work, and makes food the kids are more adaptable to. Yes, rotating it out every 5 years is a bit of a hassle, bit overall I think it is worth it. Acquiring Containers: Most people use 5 gallon buckets for long term food storage, but I use 20 and 30 gallon barrels. Why? because I have an inexpensive source of used food grade barrels. I pay $5 for 20 gallon barrels and $8 for 30 gallon barrels. You can easily pay $5 for a 5 gallon bucket with a gasket lid, so I am paying only 20% of that cost per gallon of storage space. The barrels I am buying are clean food grade barrels. Most of the barrels I have bought were used to store bulk allergy medicine. Since I am bagging all of my food in Mylar first anyways, these containers don’t have to be food grade, but it doesn’t hurt. Mylar Bags: When it comes to Mylar bags I go the opposite direction. Most people use 5 gallon Mylar bags in their 5 gallon buckets to maximize space, but think about it, would you need 5 gallons of wheat at once? probably not. I put all of my food storage items in 1 gallon bags. depending on the food being stored I get between 5 pounds and 8 pounds in a 1 gallon bag. I then put my 1 gallon filled bags into the 20 and 30 gallon barrels. I can fit 18 1 gallon bags into a 20 gallon barrel. I write with a sharpie on each bag what product it is, what the weight is, and the current month. I get 60 Mylar bags with oxygen absorbers from Amazon for around $23 A 10 pack of 5 gallon bags costs $23, so there isn’t much price difference. Getting the 1 gallon bags just means a little bit more work. Oxygen Absorbers: Oxygen absorbers should be used with all bulk ingredients with the exceptions of sugar and salt, which will brick up if used with an oxygen absorber. 1 200cc oxygen absorber will remove 200 cc of oxygen. since oxygen is roughly 20% of air, it would remove all the oxygen in 1000 cc, or 1 liter of air. As long as the true volume of a bag is at least half the space, 1 200cc oxygen absorber is plenty for a 1 gallon bag. I will process 10 – 20 bags at a time and wait until I have them all filled and partially sealed to open the oxygen absorbers and add them. I then seal all the bags the rest of the way. This keeps the oxygen absorbers exposed to the open for only a couple minutes. I use a level as my sealing surface and an iron to heat seal the bags closed. Wheat, corn, and beans will typically harden up due to the oxygen absorbers, while pastas and flour won’t. Once I have sealed all of my bags I cut a mylar bag the right size to store the remaining oxygen absorbers in and seal it shut to preserve them for later use. Water: Most bulk food needs water to reconstitute it. 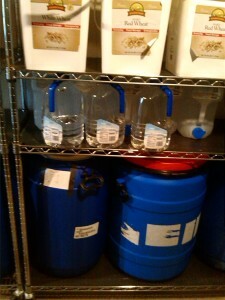 I have one shelf dedicated to clean water and store 50 gallons of potable water. These are in 2.5 gallon jugs and 1 gallon jugs bought from the store. I also have a rain barrel system that collects roughly 90 gallons of water. The water from the rain barrels is treated as non-potable, however I could filter it and treat it with bleach if drinking it became necessary. Shelving and Storage: I store all of my items on two metal shelves, which take up only about 16 square feet of space each. I received these shelves for free when my parents moved out of state. Ideally food will be stored between 55 and 70 degrees and be kept off the floor. It is important to monitor food storage for any signs of pest or vermin infiltration. As long as everything is sealed properly, the bugs and rodents should stay away. Some people have the cash available to go out and buy everything at once. Since I am not in that position I have decided to build up our 6 month supply over 10 months, spending $100 per month on long term food storage. I use a spreadsheet to track what prices are at different stores and make it a point to buy more of something if prices dip. When deciding what to buy each month I try to build the stockpile evenly. Instead of buying 150 pounds of wheat in one trip I might buy 25 pounds of wheat, 25 pounds of rice, 20 pounds of beans, 25 pounds of sugar and some dry milk. By building the supply evenly I hit a 1 month supply of food first, then a 2 month, then a 3 month, rather than having 6 months worth of wheat, but no beans and no dairy products. I also group together the items I am going to buy by supplier. Since Walmart.com offers free shipping on purchases over $50, I make sure that I order at least this amount any time I use Walmart.com. I am still amazed by the fact that they will send a 26 pound bucket of wheat to my house for around $15 and a 20 pound bag of rice for $9! This is much more convenient than making special trips to the store when building a 6 month food storage supply. Add Extras: Add in things like spices, coffee, cocoa, and hard candies. These are things that are not necessary to sustain life, but will make living off of food storage much more palatable. Expand Storage: Work towards a 9 month or 1 year total supply, or add in where your weak points are. For example, since we don’t drink a lot of milk we cut back on the recommended amount of powdered milk in our food supply from 32 pounds to 12 pounds. This is something we may expand on over time, but is not part of our initial 6 month plan. Learn New Skills: Learning to hunt and fish cheaply are important skills to have for food sustainability. Michigan is home to many popular game animals including deer, turkey, and rabbits as well as annual Salmon runs in our rivers. I have a decent creek behind my house which I am sure attracts some wildlife and from time to time has fish in it. Building a long term food storage supply is a fun (and addictive) challenge. The average goal of an emergency fund is 6 months of cash, if on average this was $18,000 (representing $3,000 monthly spending) then building a 6 month food supply for 2 adults and 4 children is only 5.5% of this amount, for a single adult it would only be $250! Personally the added security that having this food stored represents is well worth the value of having $1,000 in food and $17,000 in cash. What are your thoughts on long term food storage, have I convinced you it’s a good idea? 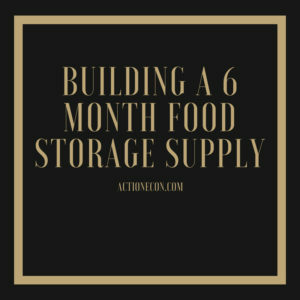 Are you going to take action to start building a 6 month food storage supply? 3 Responses to "Building A 6 Month Food Storage Supply"
Thank you for posting this blog. Regarding long term food storage, my imagination and the reality of the task were not even close to one another. I enjoyed the lesson. I hope you enjoy and then write about making your maple syrup. PS I don’t know your soil composition, but lots of Compost (manure, green, brown yard waste) and a little gypsum (for clay) made a big difference in the garden. Thank you for the suggestion Kate! I will give that a shot in the soil for next season. This is exactly what I needed! Thank you for making this!